A report released by the nonprofit National Safety Council (NSC) states that 2016 was an even deadlier year on American roads than was 2015. One federal agency has partnered with a technology researcher to try and create a solution to the issue of drunk driving, one of the leading causes of fatal car accidents. According to the NSC, the rate of traffic deaths in 2016 increased by 6% over 2015’s totals, and by 14% over 2014’s totals. Their preliminary data reveal that some 40,200 individuals were killed on the road last year. Additionally, 4.6 million people required emergency medical treatment after a traffic accident. The NSC reports that the three most common reasons for traffic accidents remain steady from year to year: speeding, distracted driving, and drunk driving. In fact, the NSC has found that drunk driving causes approximately 30% of all motor vehicle fatalities each year. Researchers estimate that 10,265 people were killed in drunk driving-related crashes in 2015. Since the total number of roadway deaths appears to have risen in 2016, the number of drunk driving deaths likely also went up. Unfortunately, many drunk drivers don’t realize that they’re too intoxicated to drive until it’s too late. A new technology could help to prevent drunk driving deaths by automatically and unobtrusively testing drivers as soon as they get behind the wheel. The Driver Alcohol Detection System for Safety (DADSS) project is attempting to create a system which would come pre-installed in vehicles, using touch or breath to assess whether someone is too drunk to drive. The systems are still in development, but two manufacturers in the field of automotive safety products have recently volunteered to build prototypes of the systems. Researchers predict that these systems could start showing up in new vehicles as early as 2020, with some states conducting pilot studies of the systems this year. 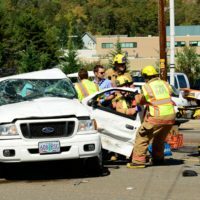 If you or someone you love has been injured or killed by a careless driver in Washington, find out if you may have a claim for money damages by contacting the knowledgeable and trial-ready Vancouver personal injury lawyer John Lutgens for a consultation on your case, at 360-693-2119.